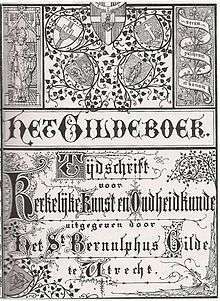 The St. Bernulphusgilde or Guild of St. Bernulphus was a Dutch secret society / trade union Catholic association established on December 1, 1869. Its intention initially was to protect national traditions of old craftmanship in religious art and church architecture. Information about the association's meetings, as well as trade information, was published in their magazine The Guild Book. The association was considered a guild and named after the 11th-century bishop of Utrecht, a passionate church builder named Bernold. The prescribed style for church construction was a conservative variant of the Gothic Revival architecture that focused on indigenous varieties of the late Gothic period, particularly the Gothic Lower Rhine, and was done almost exclusively in brick. The so-called "Utrecht School" of the association contrasted with the much more progressive views of Pierre Cuypers, who was an honorary member but for whom Gothic Revival was just a starting point for innovation. The design of the Willibrord church in Utrecht is one of many that followed the concepts of the St. Bernulphus guild association and is one of its best-preserved examples. The first church both built and decorated according to the ideas of the guild was the St. Nicolas in Jutphaas, of which Van Heukelum was appointed priest, in 1874. Founder Van Heukelum's collection of art from medieval times served as examples to form a museum in 1872. It was available to the public. This museum in 1882 was elevated to the Archbishop's Museum, the predecessor of the current Museum Catharijneconvent. 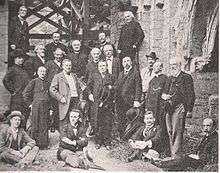 St. Bernulphus Guild in 1900. To right stands Gerald van Heukelum, founder. The most important members of the St. Bernulphus guild association were considered the sculptor Friedrich Wilhelm Mengelberg. and the architect Alfred Tepe. The silversmith Gerard Brom, the organbuilder Michael Maarschalkerweerd and the stained-glass windows maker Heinrich Geuer were other well known members. The guild stayed active until the 1930s. St. Bernulphus guild association was run more like a fraternity than a scholarly society. This characterization was typified by discussions being postponed due to copious dinners that overran their allotted time. Their meetings usually ended up in fraternal jovial feasting. The guild association even had its own song that was sung by the members. The song lyrics were written by Herman Schaepman (1844-1903), a priest. This article is issued from Wikipedia - version of the 1/28/2016. The text is available under the Creative Commons Attribution/Share Alike but additional terms may apply for the media files.